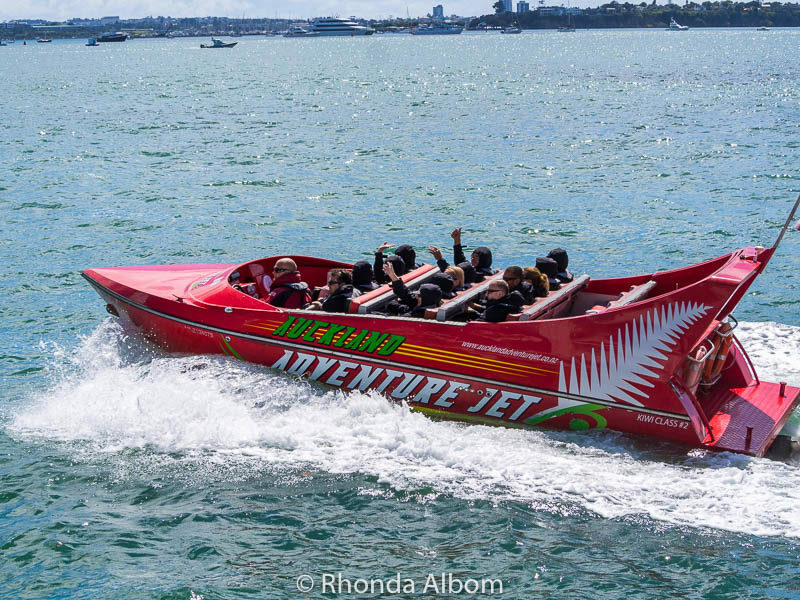 Whether you are looking for the adrenaline extreme or just a bit of excitement, Auckland New Zealand has it all. A country known for pushing to the limit, many of these are once in a lifetime opportunities. 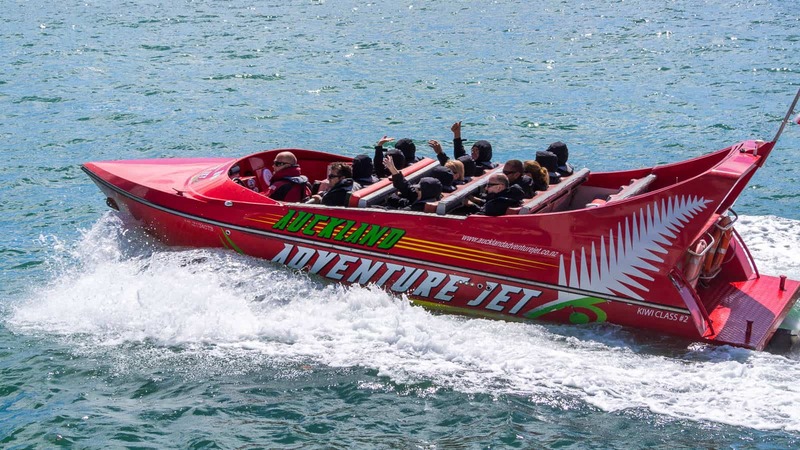 Ignore the rumour that says you must head to the South Island for adrenaline rush activities. Check out these exciting options on the water, on land, in the air, or just generally fun things to do in Auckland. While these yachts take out crew/passengers daily, this particular photo was Princess Kate racing against Prince William. This is the real thing – an opportunity to crew on a former Team New Zealand America’s Cup yacht. The expert crew is there to assist, but it is the passengers who race and steer the yacht. There are sails to adjust, ropes to pull, and decisions to be made. There are jobs for everyone who wants one. Or, choose to sit and enjoy the wind in your hair while you admire the city skyline. Either way, the two hours out on the water go by far too quickly. → Click here to check pricing and availability and book an America’s Cup sailing adventure. 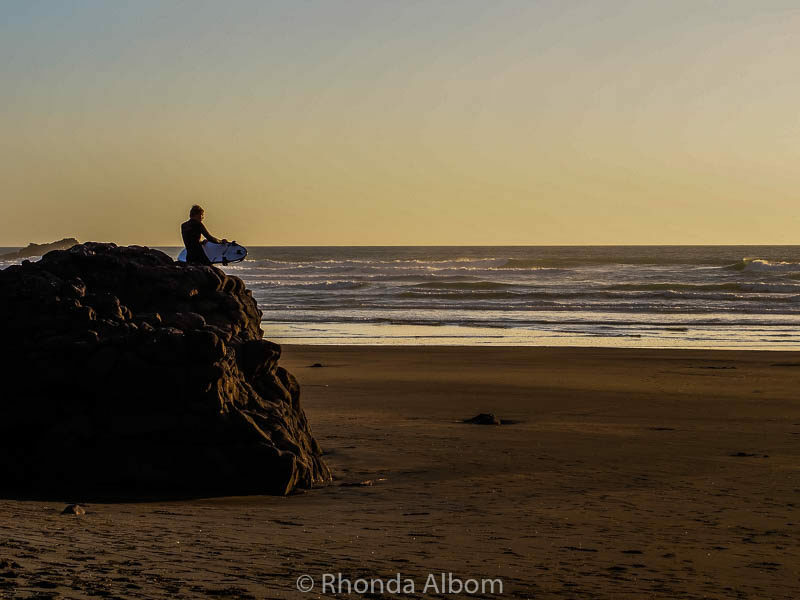 After a day of fun, the surfer sits on the rocks and waits for the sunset. The wild west coast beaches are ready for surfers, but take caution and remember to swim between the flags. And while you are here, be sure to check out the black sand. It’s loaded with magnetite, an iron-bearing mineral, making it magnetic. Should you visit Muriwai between August and February, you will find a colony of Australian Gannets that fly over 2ooo kilometres to breed on this beach (and two others) in New Zealand. → Check availability and book your black sand beach tour. 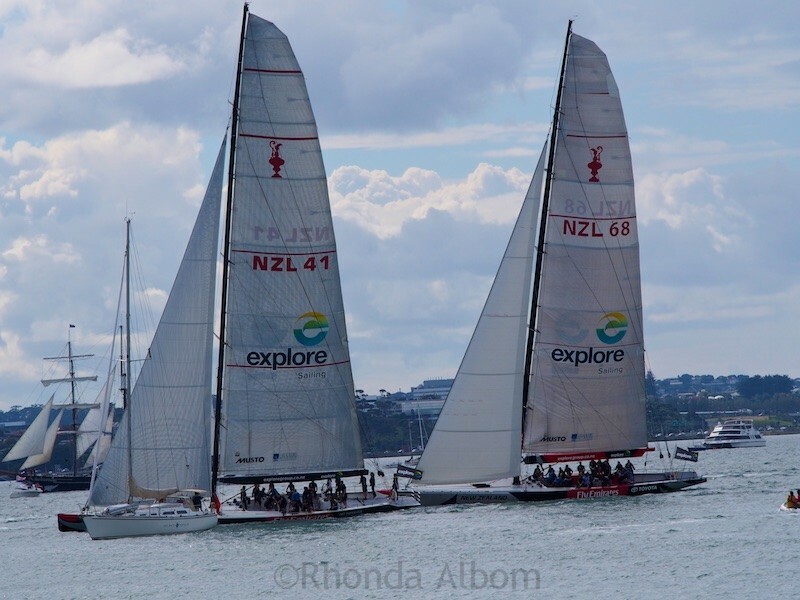 Everyone should get out on Auckland Harbour at least once, whether it be racing in an America’s Cup yacht, on a dinner cruise, on a ferry, or with the power and excitement of the spins and tricks offered by the jet boats. New Zealand’s largest theme park is small compared to some of the giants around the world, yet it is packed with excitement. 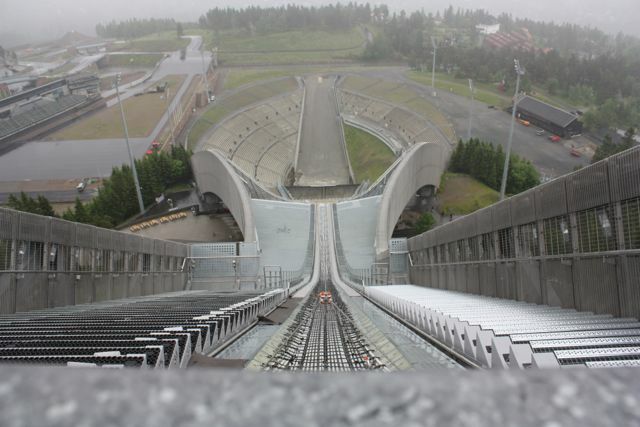 If you are born brave you can take the vertical drop reaching speeds of 82 km/hour. Test your courage on any of the five thrill rides that spin, flip, corkscrew, and otherwise leave you screaming. 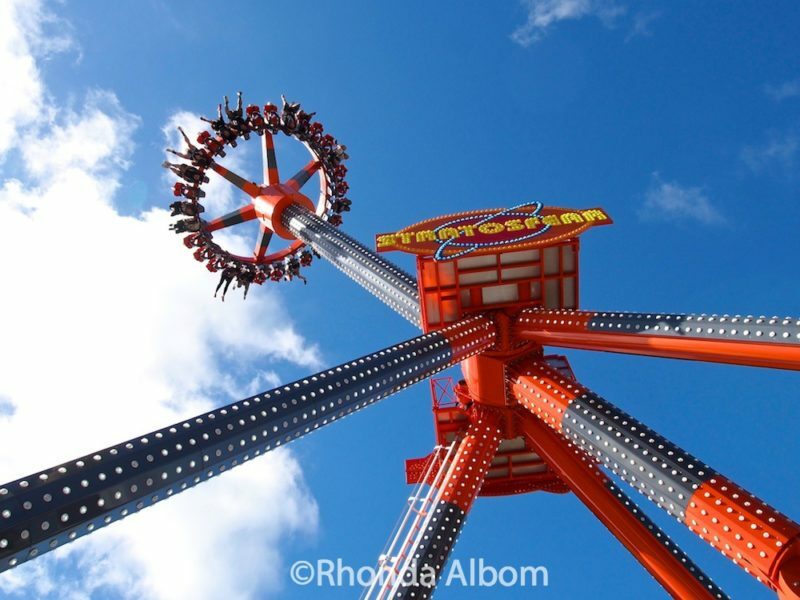 Stratosfear (shown in the photo above) at its most extreme is considered their scariest ride. 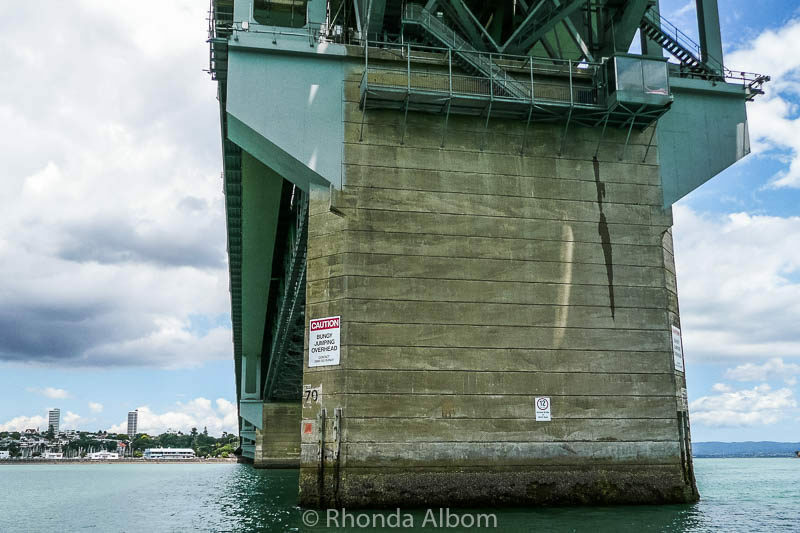 While I haven’t bungy jumped, I have sailed under the Harbour Bridge and noticed the sign on the column, which reads: Caution, Bungy Jumping Overhead. For some reason, this one just doesn’t appeal to me. However, it seems to belong on an adrenaline rush activities list, particularly since the first commercial bungy jump took place in New Zealand. → Check availability and pricing for bungy jumping. Best described as a reverse bungy, if that were such a thing. Strapped to a seat, the riders are catapulted into the air at 5Gs, reaching 200kph in just 2 seconds. At the maximum stretch, riders are floating, suspended for a moment, until they fall rapidly back down. Side by side zip lines over the forest canopy. 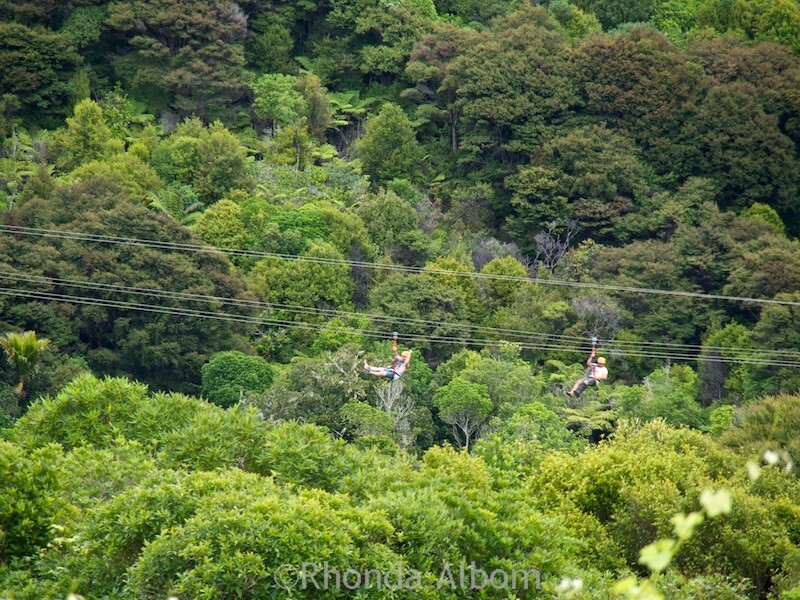 Zipping over the canopy, riders enjoy the lush green native forests of Waiheke Island. Everything about EcoZip Adventure resonates natural beauty and excitement. Before taking the ferry back to Auckland, visit one of the world-famous wineries on Waiheke Island, or visit one of the many beaches. → Check availability and book ahead for your EcoZip adventure. 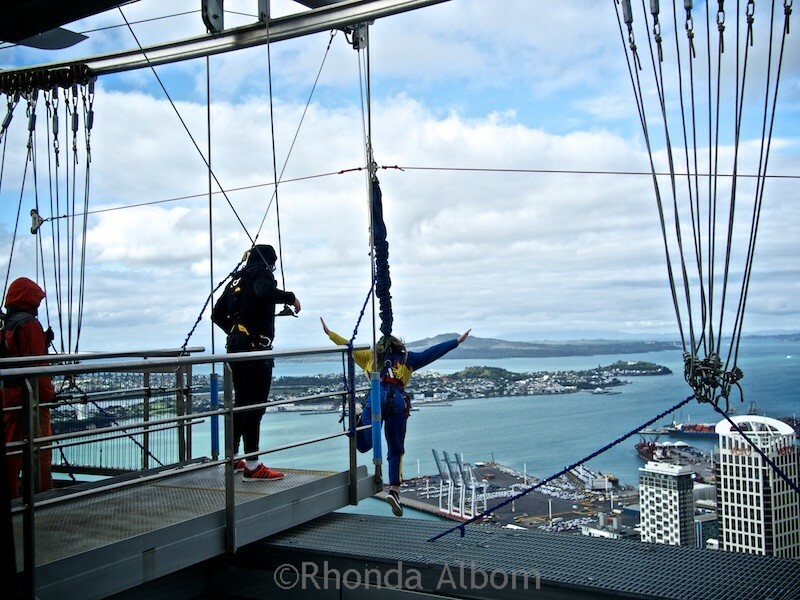 That heart-stopping moment – taking the step off the Auckland Sky Tower. Adrenaline junkies looking for a thrill have two options from the top of the Sky Tower: SkyJump or SkyWalk. The first, a base jump via wire, plunges brave riders from 192m, at speeds up to 85km/hour. It is fast enough to satisfy any dare-devil yet slower than a traditional bungy jump, thus allowing participants to enjoy both the thrill and the view on the way down. SkyWalk takes tethered visitors all the way around the tower on a narrow 1.2 metre-wide ledge suspended 192 metres above the ground. The lack of handrail makes it all the more exciting. 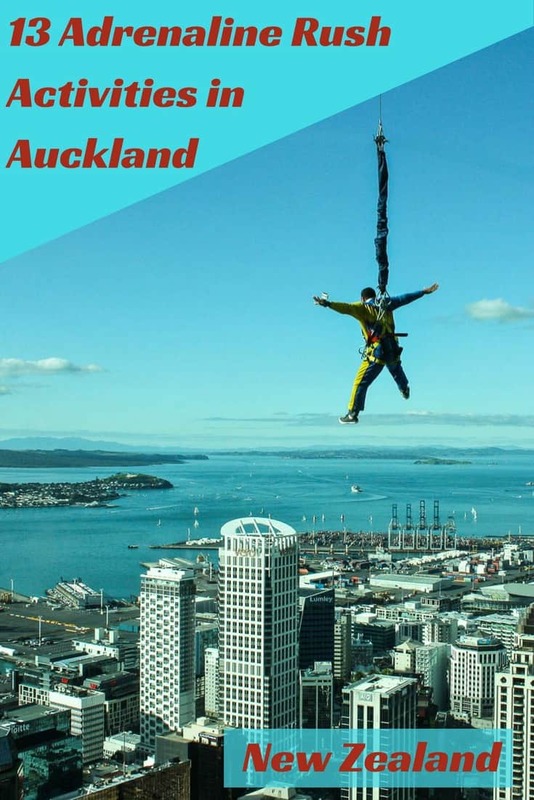 I may not be brave enough to give it a try, but it is one of the adrenaline rush activities in Auckland that should be included in this list. 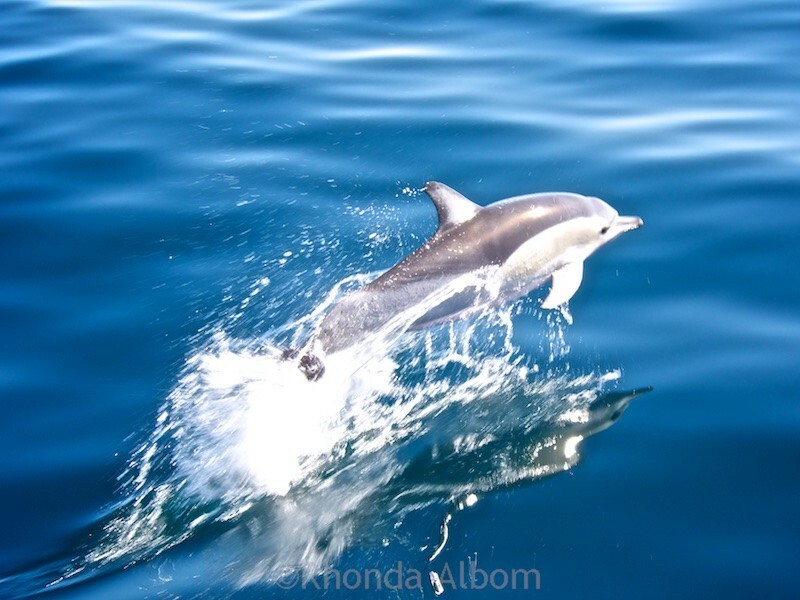 Every moment on an Auckland Whale and Dolphin Safari is exciting. For me, it is one of the most fun things to do in Auckland. Nothing tops the day’s first sighting. As the boat turns toward hundreds of seabirds diving into the water, the commentator explains that this feeding frenzy will attract dolphins, and the whales will be close behind. On approach, the boat slows and smiling passengers move towards the rails for a better view. An onboard marine researcher points out the frolicking dolphins. It isn’t long before the seabirds take flight and, in what seems like complete silence, a majestic whale breaks the water’s surface. No photos allowed in the escape rooms, just after you are out. Feel like solving a mystery? At Escape Masters you and a few friends are locked in a room, the timer is set for 60 minutes, and you need to find the clues to “escape”. I was leery at first, afraid of claustrophobia, but there is an unlocked door in every room, just in case you can’t solve the mystery or want to leave. Located right on Queen Street in the centre of town, they are easy to find. Auckland is an easy city to get around via public transportation, private car, or taxi. Before you book directly for any of these activities, be sure to check Viator as they have a low price guarantee, often offering lower prices than purchasing directly. Viator offers tours/tickets for America’s Cup Racing, visiting the black sands of the surf beaches, Jet Boats, bridge and bungy jump, Eco Zip, SkyJump, SkyWalk, skydive, and the Auckland Whale and Dolphin Safari. Viator is a TripAdvisor company, and we feel confident in recommending them. Which of these adrenaline rush activities appeal to you? Normally when I think outdoor activities in New Zealand I think Queenstown but clearly Auckland has its fair share too. I loved zip lining in Costa Rica so would love to try it at Waiheke as well. I’ve never done an escape room so definitely curious to see what they’re like. Yes, that is exactly why I wrote the post. There is a lot more to Auckland than people realize. Umm, big yes to canyoning!! I would also include mountain climbing and glacial walks. Definitely heading over soon for a mountaineering course! What a thrilling range of activities in Auckland. Auckland seems to spell adventure to the core. My personal choice of this list would be zip lining over the beautiful canopies and going for a spin and tumble on a jet boat. Personally, I prefer the beaches and the wineries when I go out to Waiheke Island, but the rest of my family will Zip. Very true, Queenstown really started it all, but Auckland is giving chase. I am an adventure loving person and that was the reason I went to New Zealand. Unfortunately, i didn’t get to spend so much time in Auckland. Skywalk was fabulous. Loved it. I would love to try other activities too. I’d do just about all of these things. I can’t make up my mind on bungee jumping though. The thought of just a rubber band basically holding me does freak me out a bit. And Escape Rooms are so fun! We have one in Bordeaux where we live, and we’ve done two of the four different mysteries that they offer so far. With the right group of friends, it can be a really fun time. Well, at least it’s a really big and fat rubber band. I do agree about the Escape Rooms. New Zealand is bucket list for my husband and I and my daughter is a huge adrenaline junkie!! So these activities are right up her (our) alley! I think I’d probably go for the whale watching first, but I know my kids would choose the jet boat immediately! If you are travelling around the country, there are plenty of adrenaline activities. Thanks Anda. I’ll bet you would enjoy the whale and dolphin safari, or at least the Escape Rooms. I don’t think anyone does them all. Some of these activities are pretty extreme indeed, but I would love to try the canyoning, zip-lining, or whale / dolphin watching. Auckland seemslike the perfect place for an active weekend (or a week)! Auckland is a perfect entry point for New Zealand visitors. There is so much more here than many people realize. I’ll just keep on feeding them to you, and one day, you will find the temptation too great. I need to come to Australia soon – but that’s for shopping. I’ve gone boating so many times and been wanting to up my game and try sailing but haven’t had a chance just yet. Auckland looks like the perfect place to try tho! And the whale and dolphin safari sounds amazing!!!!! I’ve bookmarked this for when I visit. Thanks for sharing! Auckland is the city of sails, it’s the perfect place to give it a go. Dolphins via speed boat, what a marvellous experience. It’s a really cool opportunity. I would love to do the dolphin and whale watching – anything else seems a little too intense. Your Niece seems very adventurous! The Escape Rooms are pretty mellow. These all sound like great activities for those that like an adrenaline rush. I get motion sick super easy so most of these would be out of the question unless I Dramamine up. I can zip line tho and so far haven’t had any problems! I’d like to do the escape room. but none of the others, really. I am not that brave. The escape rooms were so much fun. The skywalk sounds scary but fun! I like to do the zipline and the Jetboats for sure. Anything to do with heights (apart from ziplining) is pretty much out for me BUT I love the idea of being a member crew on a former Team New Zealand America’s Cup yacht! V ery cool. I love water sports and sailing so this is right up my alley. I know what you mean, what a great use of the former boats. Wow. Most of those are definitely outside my comfort zone but maybe I could get my courage up for the SkyWalk. I would love the dolphin/whalewatching though. It is for people like you and I that I added the last two activities. The SkyWalk and SkyJump sound pretty good, although if I were going to go skydiving I’d probably skip the SkyJump. Skydiving is definitely on my list! I like the idea of ziplines, but think I’ve been on too many – they’re just not that thrilling for me anymore. I must have built up some kind of adrenaline tolerance! They would be completely different. Sky diving would be more about the way down, while the other two are more about the thrill. My girls would do them all too. We would gladly sign up for a sail in an America’s Cup Yacht! We seem to find ourselves on boats anytime we’re near the water – definitely one of our favorite activities. Would love to go zip lining too, but haven’t yet. That seems so cool, and about as close to flying (without an airplane) as you can get! The cool thing for you about ziplining is that you would have to take a ferry boat out to the island. So you get it all in one go. This is the perfect article for us as we are a very sportive and thrill-seeking couple ! 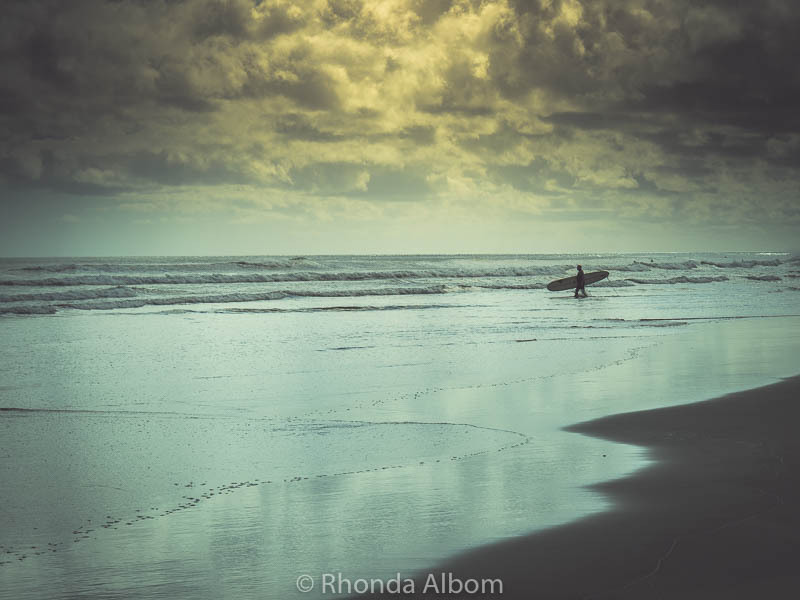 We would love to go surfing at one of the beaches at the NZ westcoast. I just do not like scary rides – I always feel so dizzy afterwards. I am not a fan of scary rides either, but I do like taking the photos. Hello, Auckland! Here I come in November. Will surely do at least a couple of them! Thanks for the heads up Rhonda! November is a perfect time to come to New Zealand. The start of the good summer weather, but just before the crowds. How awesome that you got to see Princess Kate and Prince William racing against each other! They were just in Heidelberg and did a similar thing! I know! I am quite star struck by the royal family. It was a really big deal to me. Did you see my shots on the page? I close enough to really see them. I would love to do some scary rides but I’m a scary cat. I would love to do the jet boats, Ziplining ( unfortunately I wouldn’t be able climb to get on the platform ) bungy jumping, ARE YOU CRAZY? Ha,ha,ha. Now Escape Masters, Now you’re talking. You guys sure looked like you were enjoying yourselves. What I life. Have a great time Rhonda. See ya. LOL – I am with you on the bungy jumping. Notice, I am safely behind the camera for all of it except the Escape Masters. I love the water too, but I prefer it a bit slower than the jetboats. Sorry, I can’t see either of those becoming spectator sport, although one of my high school friends managed to get on the tonight show for speed reading. New Zealand is the extreme adventure country by excellence. I am not surprised by the many adrenaline related activities in Auckland. Rhonda, I have been having problems with leaving comments lately. When I hit “Post Comment,” I get a “Database Connection” error and the comment does not go thru (maybe it does, sorry if I am commenting more than once). Maybe it is something to take a look. It has happened to me at least three times. I was actually surprised there to find so much extreme activity in the city. I think I must have been a sailor in another life because the America’s Cup Sailing would provide all the rush that I need. That’s definitely my number one pick from your list! Ziplining would be number 2! Don’t forget that whale and dolphin boat. It sure got my adrenaline pumping, but in a different sort of way. New Zealand has long been renowned as an adventure playground for thrillseekers. I have visited many times over the years and normally participate in something adventurous whether it be skiing, jet boating, cycling or hiking. Thanks for giving me some more inspiration. Very true, we are home to the adventure capital of the world. Exciting is the ideal word for these activities. Loved your Piha beach shot and the skywalk shot with the person dangling (that will never be me) and the dolphin – that couldn’t have been easy to capture. LOL – that person in the skywalk shot isn’t dangling. She just stepped off and is on the way down. What is it about kiwis that they love to hurl themselves into the air at high speed. Much as I love my fellow antipodeans across the ditch, I think you are all a bit whacky. I love the sign under the bridge. How exactly do you exercise caution if a bungee jumper is about to crash into you? Fantastic photo of the dolphin. I wish I could take photos like that. LOL – as an immigrant myself, I can’t help but wonder the same thing. And, thanks. Most of these sound really fun and exciting. Love the water adventures. I’ll pass on the Skyscreamer and Skyjump. We went to Auckland many years ago for part of our honeymoon and these activities make me want to go back with the kids. I pass on those two as well. However, they are both fun to watch others give them a try. As for the kids, several of them require a minimum age or size. Come back for the beauty of our country. Now, you really have me wanting to travel to New Zealand. Very beautiful photos. Thanks Patrick. New Zealand is a land of beauty and extreme fun. yeah nah everything there except sailing is just a no for me lol. I prefer life on the water not way above it. I also love the water, so the sailing and dolphins are my favourite, plus the Escape rooms. You can keep the zip line stuff but I’d be all over the water. They really clamp you in on those jet boats, don’t they? You got some fantastic shots, great action, and angles and that wistful shot of the surfer. You and me both. I like my feet on the ground, or on a boat. I am a water baby. And thanks. If you go to the observation deck, there is no outside option. That is only for the jumpers and Skywalkers. Would love to do the ziplining. That looks great fun!! My girls love it. Taking the photos is enough of a thrill for me. The Skyscreamer and Rainbow’s End are my type of ride! I’d love to try the bungee jumping, but I think my husband would draw the line there. My daughter went on Skyscreamer over and over. Not me, I would even go on it when it was doing a less extreme run. It has two queues, one doesn’t go upside down. Escape Masters sounds fun. So does the jet boat. Not jumping from anything though. 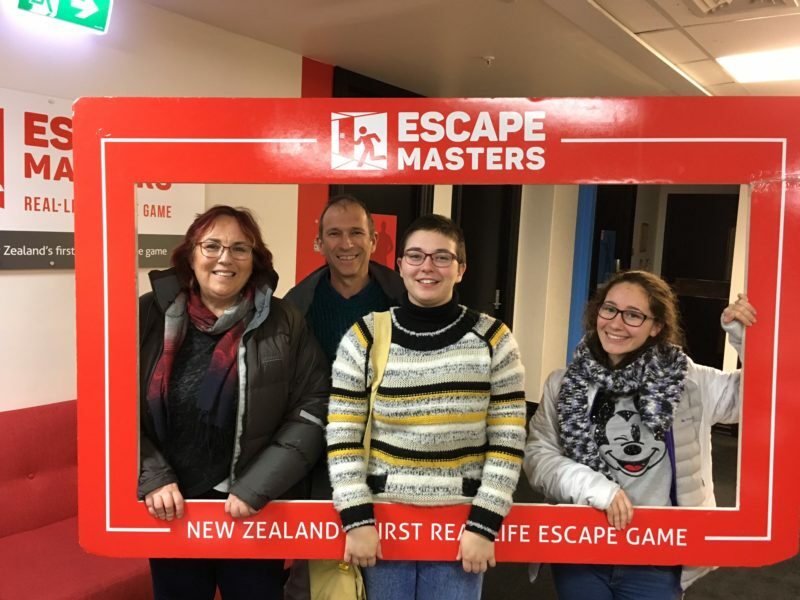 Escape Masters was really fun, and frustrating at times. We got out with just four minutes left on the clock, and we had to use all three available clues. The Escape Room was really fun. We just did it a few weeks ago and had a blast. With about 7 minutes left, I thought we were going to fail, but then we suddenly figured out the missing piece and were out with 4 minutes to spare. I love sailing too. We used to own a yacht. What a lot of fun things to do! Never a dull moment if you don’t one. none of these things for me thanks anyways. I like my feet firmly planted on the ground. If I was younger my heart might be abler to take some of these adventures, but, for me, right now, I’ll just watch! 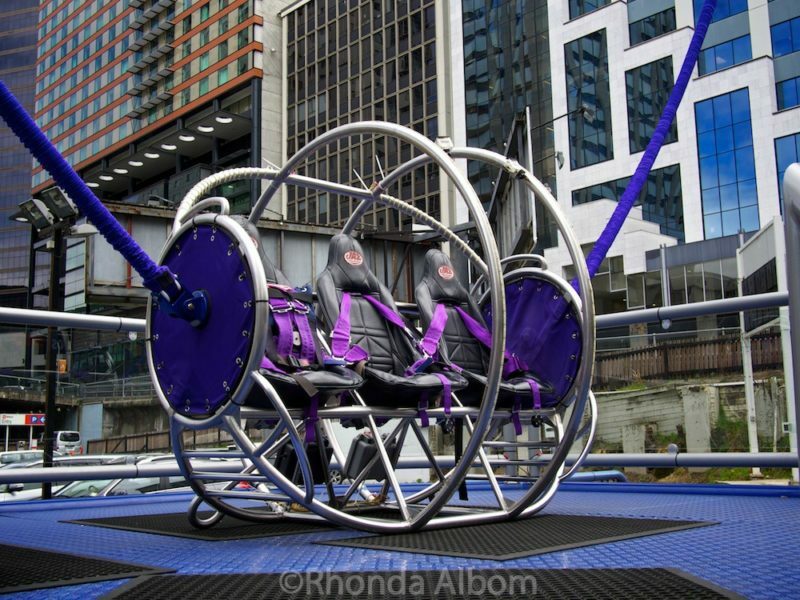 There are plenty of non-adrenaline rush activities in Auckland as well. You don’t have to be a thrill seeker. A nature lover will also enjoy New Zealand.